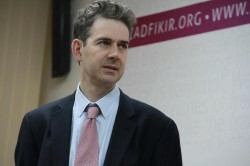 Thomas de Waal is a writer and analyst on the Caucasus, Russia and the Black Sea region and a Senior Associate with the Russia and Eurasia program at the Carnegie Endowment for International Peace in Washington. He is the author, most recently, of The Caucasus: An Introductionpublished by Oxford University Press in August 2010. In the 1990s Mr de Waal was a journalist in Moscow for The Moscow Times, The Times of London, and The Economist, specializing in Russian politics and events in Chechnya. Tom is co-author with Carlotta Gall of Chechnya, A Small Victorious War, (Pan, 1997 and NYU Press, 1998) (for which they were awarded a James Cameron award for Distinguished Reporting) and sole author of the authoritative book, Black Garden: Armenia and Azerbaijan Through eace and War (NYU Press, 2003), which has been translated into Russian, Armenian and Azeri. He has also worked as a reporter, editor and program manager for the BBC World Service and the London-based NGOs, the Institute for War and Peace Reporting and Conciliation Resources. Mr de Waal is the author of dozens of articles for publications round the world and has made many radio programs for the BBC.